Dear Readers, I am very excited to post my first ever DIY project- and a sewing one, no less. My Mum can’t understand how I ‘ve suddenly managed to develop an interest in sewing- and I have no clue either- the project just inspired me. While surfing the internet and reading blogs, I came across a lovely patchwork quilt topper tutorial– the quilt topper was beautiful and instructions seemed easy. The next day my Mum was about dispose of some random pieces of fabric she had lying around for ages. One of the reasons of their neglect, was that a quite a few of them were differnt shades of yellow- which is n’t a family favourite. So, in an inspirational moment I told her to give it to me and that I’d turn it into something..beautiful.. erm-that I’d try anyway, and if it didn’t work we could dispose of it. The amount you need for each fabric depends on what size quilt topper/ duvet cover you would like to make. 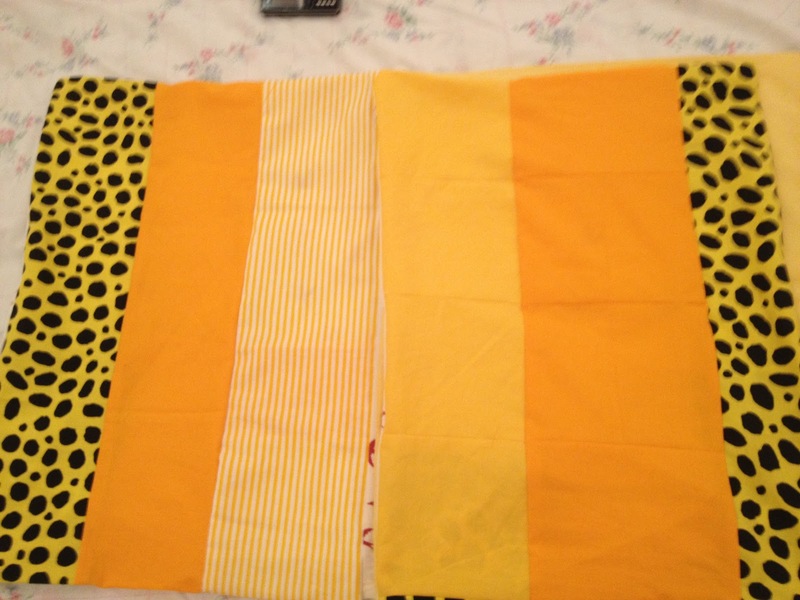 I was making one for a king size duvet cover which is 220cm by 225cm. The pattern requires us to make a square quilt made up of 13 squares. 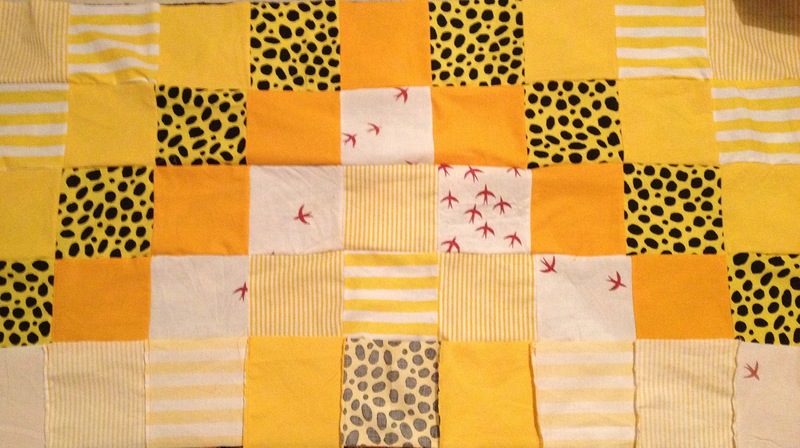 17cm should be the finished size of each square. 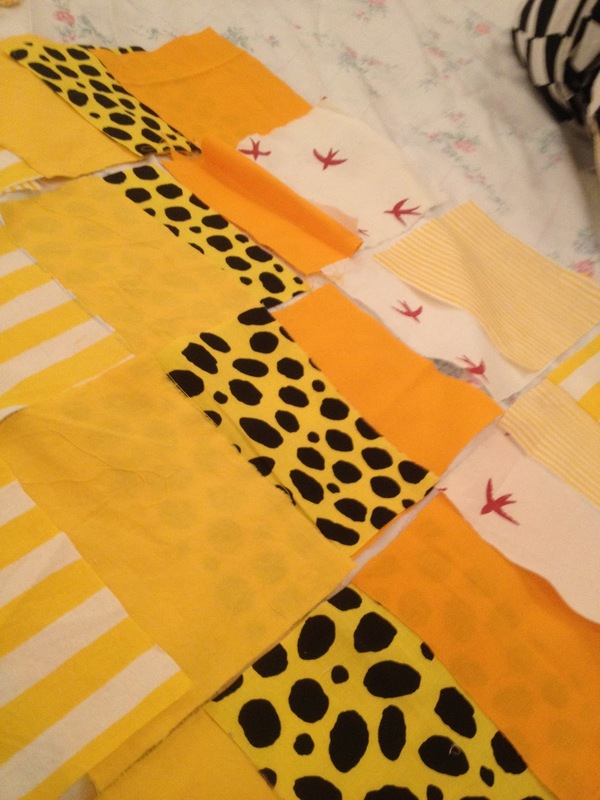 that means leaving a half cm allowance for stitching on each side, you should cut out 18cm squares. Fabric number 6 requires 28 squares, so you’ll need a bit more fabric. You may re quire extra fabric to make sure the finished quilt covers the bed/duvet, as the square topper is only going to be 221 cm I will add a 5 cm strip to one end, you could add two 2.5 cm to both ends. Remember that fabric number 6 will be the most prominent one, according to the pattern, so choose carefully. In my pattern no. 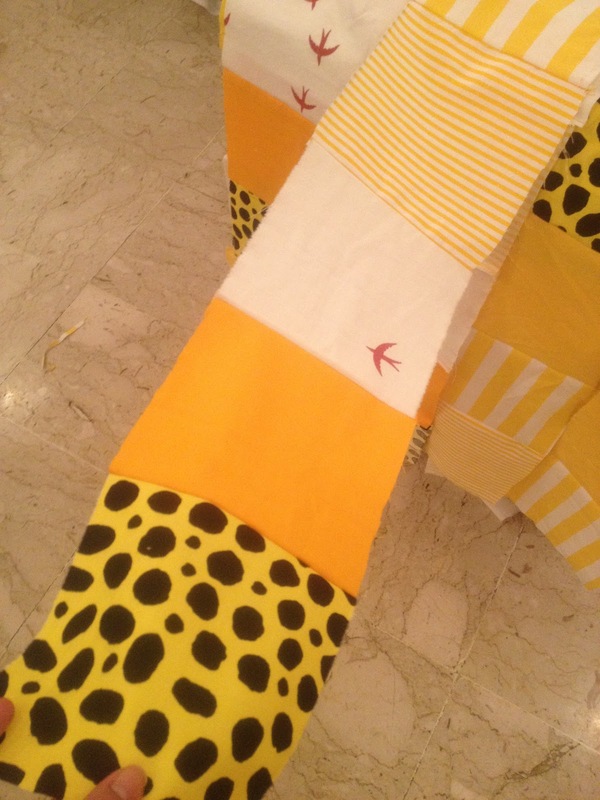 6 is the orange fabric, 5 the cheetah print, 4 mustard yellow, 3 thick yellow and white horizontal stripes, 2 thin yellow and white vertical stripes, 1- white background with brown birds printed it on it. 1. Cut out squares of each fabric, make sure you measure properly, otherwise you will be sorry at some point, and then unless you have tonnes of fabric it will be too late to do anything about it. 2. Play around with the fabric, until you can decide which fabric is going to be 1,2,3 and so on. I would make the darkest/brightest 6, and the lightest 1,and the rest according to how they would look next to each other. 3. Once you have decided which number to assign each fabric, place a sticky note or piece of paper atop each pile so you don’t get mixed up. 4. For the first row collect all the squares in the correct order. Placing the first two squares right sides facing each other stitch together 0.5cm from the edge. Flatten the seam open with your nail. Next open up the two squares, sew on the next square in the same way until all squares in the first row or sewn together. Cut away any lose thread, fold and set aside. Be accurate in your 0.5cm seams as it will matter later on. 5. Once you are finished with rows iron the rows and press seams open. Stitch together the first two rows, roll up the finished squares of fabric as you go along to prevent it from tugging and pulling what you are currently stitiching. 7. Repeat until you reach the 7th row. Then start the same procedure from the 8th row till the bottom. This is to reduce the bulk you have handle, and so that you only have to deal with the full bulk of the fabric once. Stitch the two halves together. In my case, I needed to attach, a strip of fabric to the edge to make up the extra 5 cm of width. 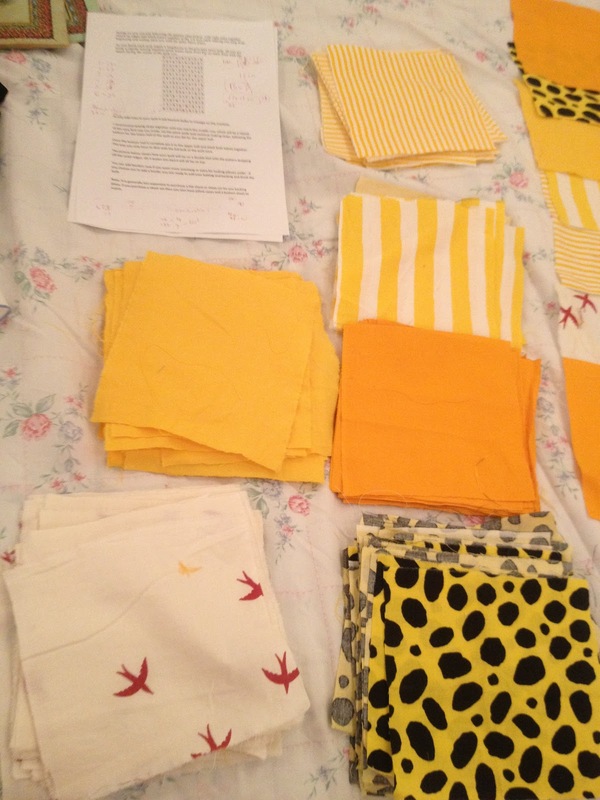 If you are making a duvet cover like myself, you can simply sew a flat sheet cut to size, to get the back of the quilt. 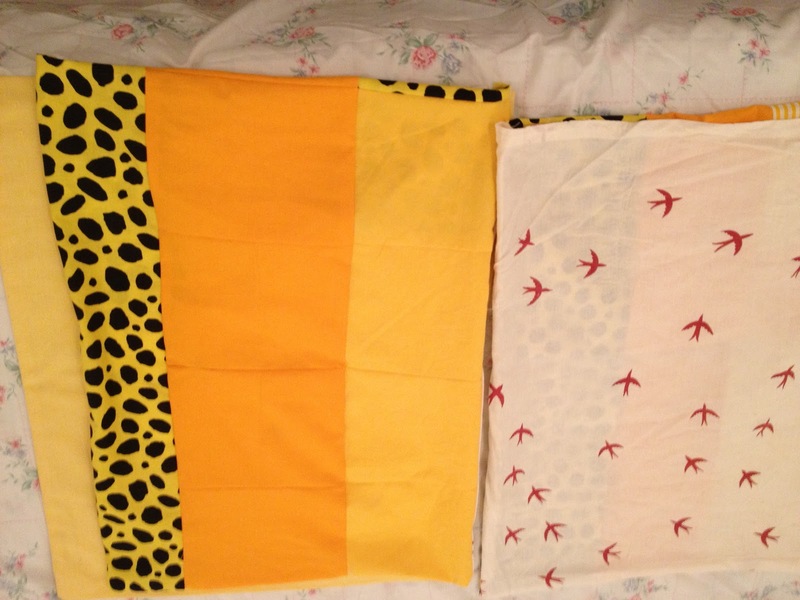 If you have leftover fabric, you can make pillows, be as creative or as simple as you want. Tip: Once you have laundered it, and if you are not going to use it immediately, you could fold the cover, and store it in a pillow case,and any matching bedsheet, and additonal pillow cases, neat and organised storage. You may also like this post I’ve made spring/ summer blossom edition of this patchwork duvet as well. Amazing i just love this…. Olá! Adorei suas publicações. Um abraço.